Ezt a terméket eddig 43 alkalommal vásárolták meg! 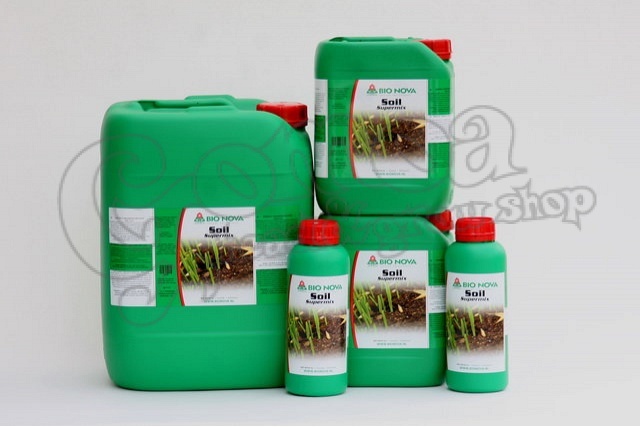 Soil SuperMix is a one component mineral fertilizer especially adapted to systems with soil. NO3, NH4, NH2, SO4, P, K, Ca. All of the elements mentioned above are 100% pure and of an organic origin. Therefore this fertilizer is absorbed directly, and a low EC will suffice. Furthermore, the organic components work as a good buffer. Soil SuperMix enhances an optimal soil condition, actively stimulates the root development and provides as a complete fertilizer not only for growing but also for flowering. Apply a supplement of PK 13-14 as Superbloomer during the flowering period. In spite of the application of chelates (chelated micro elements) which makes this fertilizer virtually pH-independent, it could be necessary to adjust the pH. Use phosphoric acid to adjust the pH downwards. Use potassium-hydroxide solution to adjust the pH upwards. In this case you will need 4 grams of potassium per litre of soil per 0.5 pH.